This rugged design turns a five-gallon bucket into a cooler. It keeps drinks or bait cool, and can even work sans bucket as a soft-sided cooler. The water-resistant, double-stitched design is durable, with plenty of pockets for extra storage (like tackle or other gear). Dimensions: 15" x 14" x 14"
With a Boozie Bucket in place on a standard five-gallon bucket, you’ve got a cooler built to make trips on the boat or sitting on the dock better. And it does more than just keep drinks (or bait) cool. 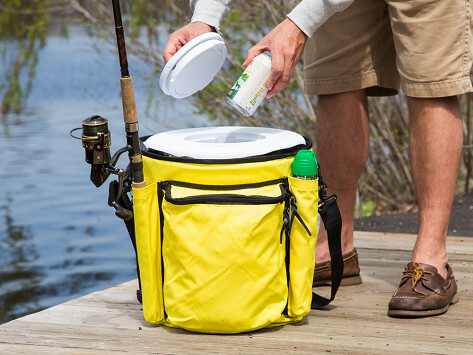 The soft-sided cooler fits over a bucket and instantly makes it more functional. There are pockets for tackle and other gear, and the design is water-resistant and double-stitched to be extra-durable. The reinforced lid has a twist lock, and a draining gasket to run off water, or to run an aerator line to circulate air and keep bait fresh. And this lid is tough enough to double as a seat, too. 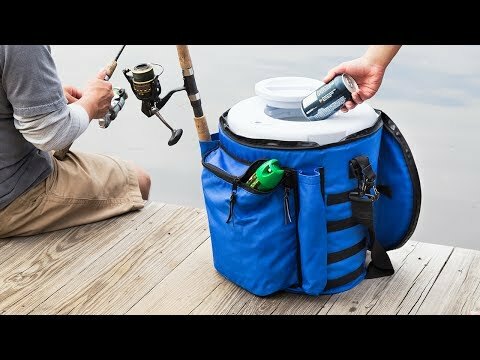 It was created for fishing trips, but The Boozie Bucket works just as well for tailgating, camping trips, or hunting excursions—with or without your bucket.